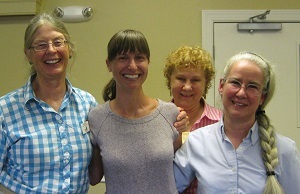 As you may know the Virginia Master Naturalist Program acquired a new coordinator, Alycia Crall, in January of 2013. She comes to the Program from Rutgers University where she was serving as a postdoctoral scholar on a National Science Foundation funded grant to initiate citizen science projects with several of the VMN chapters. Alycia got her bachelor’s degrees in Environmental Health Science and Ecology at the University of Georgia, her master’s degree in Ecology at Colorado State University, and her PhD in Environmental Studies at the University of Wisconsin-Madison. You may be familiar with the needs assessment she initiated over the summer of 2013. The results of that assessment informed her Strategic Planning sessions held during November in four Virginia locations. Headwaters members Tom Long and RoxAnna Theiss accompanied our Advisor, Paul Bugas, to the November 22nd session in Charlottesville. There were at least fifty other Chapter representatives present for the all day session and it was packed with information and future planning. There were nine topic breakouts and the three Headwaters representatives did a good job of covering most of them. There are on-line Advanced Training sessions starting in January. Keep and eye on the VMN-VMS calendar for each month’s presentation. There is a Financial Manual and the establishment of a state controlled Foundation account in process to make handling Chapter finances easier and less prone to stress. There is under consideration the development of a pool of presenters from which Chapters can draw for Basic Training classes. Addressing concerns about the implications of calling all graduates of the Basic Training Program “master” naturalists, the state program is considering implementing a tiered approach from “amateur” to “master” category. The long awaited Manual for Basic Training is nearing completion and should be available in various formats from paper to digital. Leadership training and a leadership manual will be part of the state program initiative. There will be an increasing focus on the needs of Chapter members from more social connection via face to face and social media to matching interest with projects in an effort to build and solidify chapter and program cohesion. And finally, the all important need to build awareness within the local and wider communities of the VMN Program is being addressed. It was a rewarding and worthwhile day – beyond expectations on many levels. It created a hopeful energy for the future and an appreciation for the growth and commitment to the Program by so many capable and dedicated people. State program coordinator Alycia Crall has recorded her 48 minute presentation to the four statewide strategic planning sessions held in November, 2013, and made it available for viewing online here. The final survey responses, along with findings from the needs assessment and strategic planning sessions, will be presented to our program’s steering and executive committees and several additional volunteer representatives at a meeting on January 23. At this meeting, decisions will be made on how we plan to move the program forward over the next few years in light of available resources and feedback from all of you. Many thanks to all of you for participating in this process. This is your program, and we wanted to ensure that you had multiple opportunities for input into this process. As always, please feel free to email (acrall@vt.edu) or call me (434-872-4587) with any questions or concerns that you may have. January 3, 2014 in Chapter Business.